How to make the BEST Vegan French Toast! So easy to make in just 10 minutes, using everyday ingredients. You won’t miss the eggs at all in this delicious weekend morning breakfast. 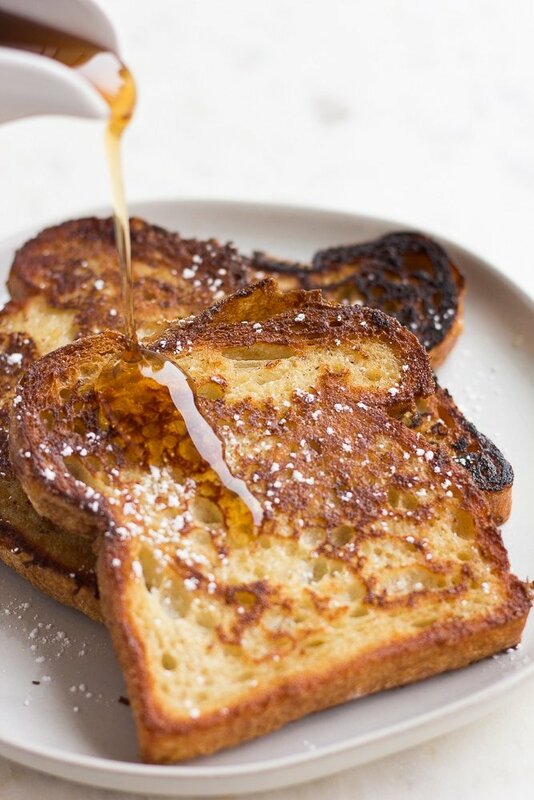 A secret ingredient makes these french toast incredibly crisp, thick and perfect! French toast was one of the first meals I started making for myself as a kid. There wasn’t a lot of cooking or baking going on in my home growing up, in fact I lived on mostly convenience foods like canned spaghettios, ravioli and pop tarts. But we did make french toast a lot, especially on the weekends! It was easy, fast and simply delicious. I had never made a vegan version of french toast before testing this recipe. Honestly, I was quite doubtful it would work, or be delicious enough to even post here. 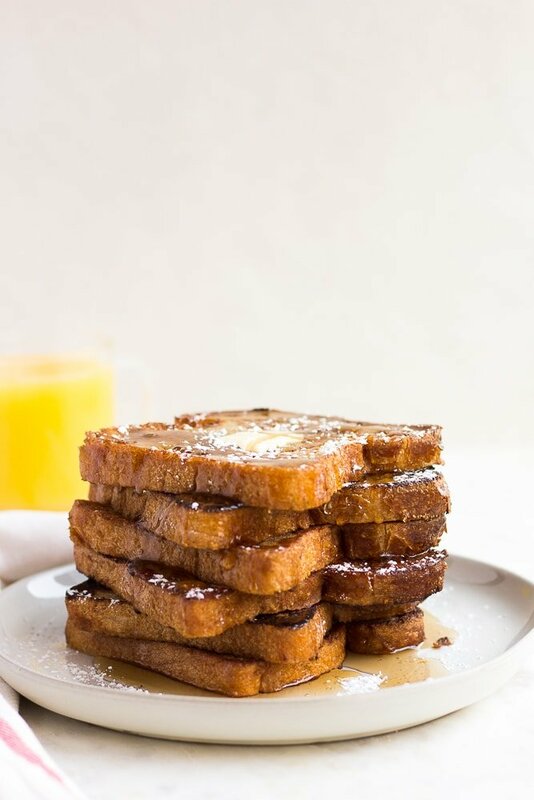 I have seen recipes for vegan french toast before, but I really couldn’t see how they could possibly taste as good as the nostalgic breakfast of my childhood. Well, I was SO wrong! My family and I were SHOCKED at how good this vegan french toast tasted, and we ate the first batch up in about 5 minutes flat. Creamy on the inside (but NOT soggy at all), crispy on the outside, with hints of cinnamon and vanilla. 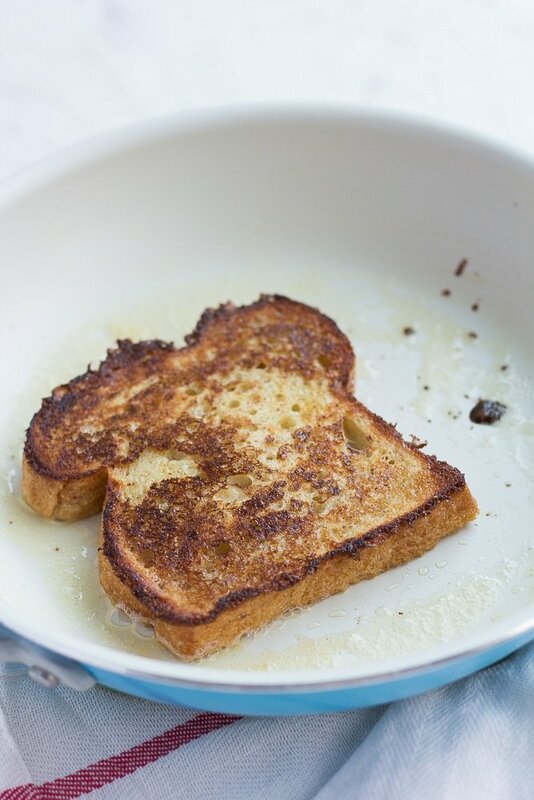 The perfect french toast, period, and SO darn easy to make!! 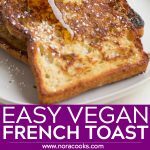 How can I make Vegan French Toast without eggs? 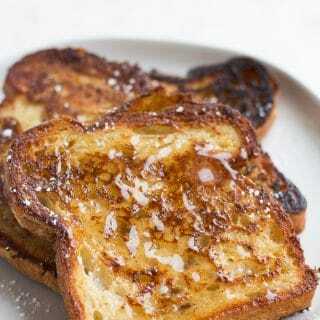 The secret ingredient in my french toast recipe is so common I’m sure you have it in your pantry right now: Cornstarch. It’s perfect for getting that crisp exterior, and works like a charm as the bread cooks in the pan. 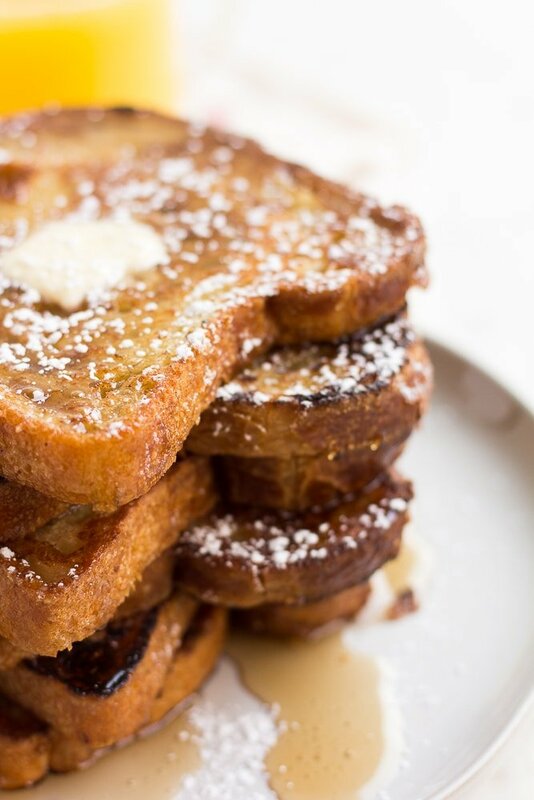 Without eggs, your batter for vegan french toast includes these ingredients: Soy milk (or any other non-dairy milk), cornstarch, ground flaxseeds (just a teaspoon, to help thicken the batter), 1/2 teaspoon baking powder (trust me), maple syrup, cinnamon and vanilla. It’s as easy or easier than the original! Whisk all the batter ingredients in a shallow bowl, large enough to hold a piece of bread. Heat a little vegan butter or oil in a frying pan. Right before dipping the bread in the batter, whisk the mixture again (cornstarch will settle to the bottom.) 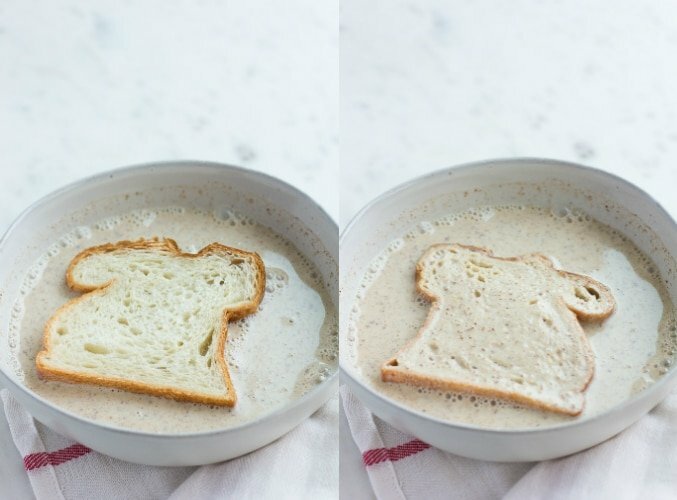 Dip a piece of bread in the batter, on both sides, and soak for about 10 seconds. Add the bread to the pan, and cook for about 2-3 minutes on each side, until golden brown and crispy. Repeat with all remaining bread and batter, then serve immediately with maple syrup, powdered sugar and fresh fruit, if desired. I used a quality loaf of ciabatta that was 1 day old. It was perfect. I wouldn’t recommend using soft sandwich bread, or your french toast runs the risk of being soggy. Thicker sliced bread works best, that is quite dry, such as french bread, sourdough or even a day old baguette. Smaller bread is fine, you will just have more french toast! I hope you enjoy this Vegan French Toast!! How to make the BEST Vegan French Toast! So easy to make in just 10 minutes, using everyday ingredients. You won't miss the eggs at all in this delicious weekend morning breakfast. 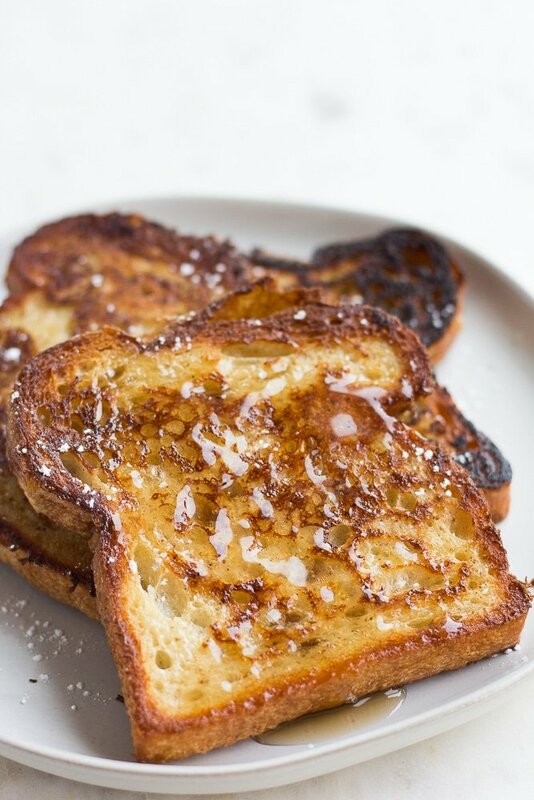 A secret ingredient makes these french toast incredibly crisp, thick and perfect! 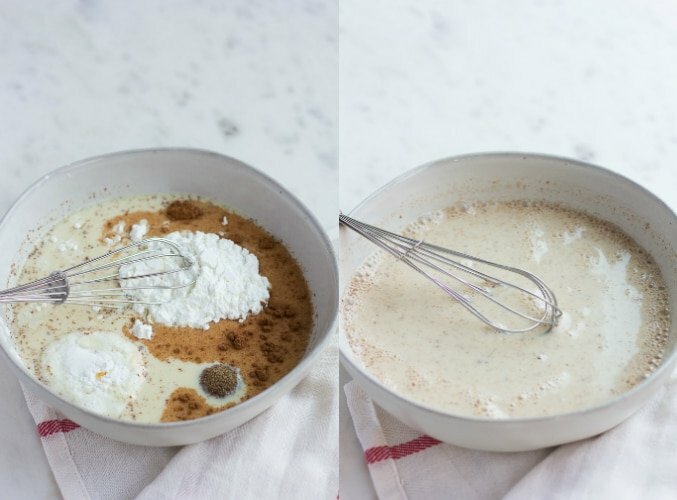 In a shallow bowl, wide enough to hold a piece of bread, whisk together the soy milk, cornstarch, ground flaxseeds, baking powder, cinnamon, maple syrup and vanilla. Add a little bit of vegan butter/coconut oil to a pan over medium-high heat and melt. Whisk the batter again right before dipping bread, as the cornstarch will settle to the bottom of the bowl. Dip each side of the bread in the batter and let soak for about 10 seconds, then add the bread to the pan and cook for 2-3 minutes on each side, until golden brown. Add more vegan butter/oil to the pan as needed in between pieces of bread. Serve with maple syrup, powdered sugar and fresh fruit, if desired. May use any kind of non-dairy milk, such as soy, coconut, almond, cashew or oat milk. For gluten free vegan french toast, use gluten free bread. This recipe does not freeze well, and is best served fresh.